The Macintosh community was devastated to learn today that Senior Vice President of the iPod division Jon Rubinstein was devoured by beavers. According to sources, the Apple executive was sitting quietly in his office when approximately a dozen vicious, killer beavers entered and completely consumed him. A visibly shaken Chief Operating Officer Tim Cook was uncertain how the beavers got as far as Rubinstein’s office. “They apparently signed in and received badges and everything,” Cook said. “We’re going to, um, look into our security procedures. Other Apple executives were less matter-of-fact than Cook. “Nooooooo!! !” screamed Chief Technology Officer Avie Tevanian, falling to his knees and tearing at his shirt. “Johnny! JOHN-NY!!! 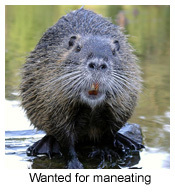 Cupertino animal control is asking residents to keep an eye out for a gang of roving beavers. How did Moltz know about an attack by super-secret Delvian assassins (maneating beavers) so soon unless he and the Entity were behind it? The Galactic Council will want to know. Is this related to Moltz’s heinous attack on Miller? We are watching! Microsoft releases iPod(division president)-killing beavers! Bill Gates was right, they do have an iPod-killer! Will they start going after iPod users next? Say what you may, beavers are industrious and enterprising. They are builders, nature’s engineers. Except for the carnivorous ones, that is. Those are heartless and destructive, and their motives are mysterious. Perhaps they are settling a score. Springfield Homer mutants obviously. Arrest all three fingered people. Rubenstien was only 6 weeks form retirement. Wow, CARS has actually provided me with some info I didn’t know about the ‘real world’. On second thoughts, executive-devouring beavers aren’t *that* ‘real world’. Ever try keeping those damned things away from a mostly-wooden airplane? How ‘n the hell are they conducting business over there? I bet Rubenstein is regretting stealing funds from the Lesbian Ninja Sexbot division now. If he had left there funding intact they may have had more than the one prototype available for cambus security. What a fight that would have been, lesbian beaver versus maneating beaver. The fur would have really flown. See, if I was there those little hairy bastards would have gone down faster than a lawyer!!! I mean John would still be dead, but hell friendly fire and all that. You know what they say kill-em all and and sort them out later. I’ve always heard impressive things about Jon’s wood. I guess the rumors were right, beavers always know where to find the best wood. And right before the Blue Fairy was going to turn him into a real boy, too. This is why I read CARS. The “Mainstream” Media will cover this up! Just watch, I bet there won’t be a single mention of this anywhere. I would have thought the Lesbian Ninja Sexbot cadre would be out in force over this outrage. Slow day I guess. This has been the best dam post on CARS in a long time. Johnny, we hardly knew ya. Vicious, killer beavers?!!1! Best. Article. Ever. Lesbian, ninja, beaverbot iPod killer’s tails. SIGN THE FRICKING ONLINE PETITION ALREADY!!1! I’m beginning to think that g0rdo is just jinzo with a new name. Can’t tell from the IP addresses. But the overwhelming scent of Hai Karate is a dead giveaway. Pingback: Crazy Apple Rumors Site » Blog Archive » Avie Tevanian: The Exclusive CARS Interview! Hi My Name Is ivauhz. love your stuff!!!! Please let me know when you update your site. I’m always looking for something funky! Previous Previous post: Gates Details Plan For "iPod Killers." Next Next post: Amazon Challenges Apple.